Boeing and Liquid Robotics have used a network of persistent unmanned surface vehicles to detect, report and track a live submarine during the U.K. navy’s Unmanned Warrior 2016 demonstration. Liquid Robotics said Monday four Sensor Hosting Autonomous Remote Crafts equipped with Boeing-made acoustic sensors were deployed off the coast of Northern Scotland to locate an unmanned underwater vehicle and a manned diesel submarine as part of a live anti-submarine warfare mission. SHARCs offered intelligence to commanders throughout the two-week demonstration via more than 100 automated contact reports, showing the USV’s capacity to autonomously conduct ASW missions and exchange data. 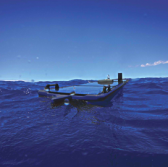 Gary Gysin, Liquid Robotics president and CEO, said the two companies collaborated in efforts to achieve a new milestone in unmanned maritime warfare and demonstrate the use of SHARC to deliver intelligence data in real time. Liquid Robotics added that a pair of SHARCs equipped with meteorological and oceanographic sensors previously collected data in the North Atlantic to facilitate the development of sensor prediction models for the Unmanned Warrior and Joint Warrior training exercises in the U.K.